← Information about the SDC: goals, objectives and history. All of our SDC staff, students and community are happy to announce the completion of our SDC Basic Course for 2014 – 2015. We marked the end of this course with our graduation ceremony for the class of 2014 – 2015. We held our graduation ceremony on Saturday the 28th of March 2015 for the 48 successful graduates of our 2014 – 2015 Basic Course. Before holding the ceremony, students and staff prepared for the ceremony. We invited an audience comprising of many different sectors of our Karenni Society. Many of our alumni attended our ceremony. Other attendees included parents, relatives, friends and supporters of our SDC. There were also the students of the women’s study program. A number of leaders attended the ceremony alongside the Coordinator of SDC, Aung Sun Myint Steven. Attendees of the ceremony included the Karenni Health minister, Karenni Refugee Committee chairperson and the head of the Karenni Education Department. The leaders made a series of speeches to our audience. These speeches varied from encouragement for the future to explanations of our situation. 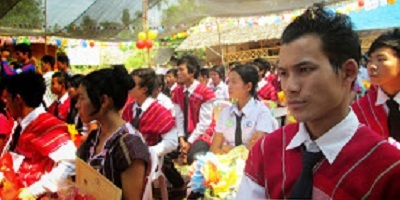 The leaders spoke in both Burmese and Karenni language. This ceremony celebrated the achievements of the students in the core subjects of Human Rights, Environment and Law. During the course, the students also participated in research and a moot court. Additionally for the first time, we provided SDC students with an opportunity to participate in internships. During the ceremony, the students collected their certificates. 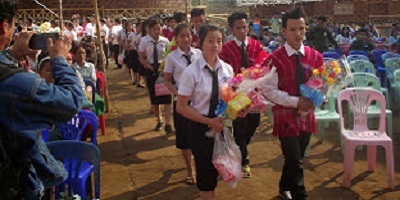 There were also prizes for the top students in each of the subjects. On the stage, our students also provided our audience with singing of songs and traditional dancing. After the ceremony, we ate together and shared about our experiences and our future plans. After the SDC basic course, our students make important decisions as to their future. Some will continue their studies on our SDC Advanced Community Management Training Course. Some of the other students will begin working at organisations in our community. This year’s graduation class was our biggest ever class with 48 students graduating in total. The increase in numbers of our program is due to both the interest of the students and the need for the knowledge of these subjects to be disseminated amongst our community. Our ability to run a course for this many students is founded on stability within our organisation. For this stability, we must thank our donors, partners and supporters for providing us with encouragement to go on and reach our goals. We are very proud of our new graduates and we look forward to them fulfilling their aspirations. It was a pleasure to hold our graduation ceremony and to share our achievements with our community. We are confident we can continue to garner further success in the future. 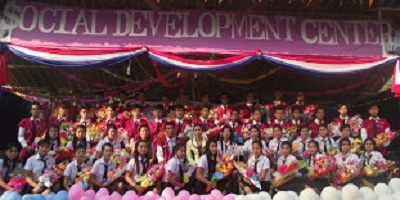 This entry was posted in Basic Course, News and tagged Karenni Students pride, SDC, SDC graduation, Student's success. Bookmark the permalink.